On a vacation away from their family, Tom (Lewis Fiander, of DR. JEKYLL & SISTER HYDE) and his pregnant wife Evelyn (FAR FROM THE MADDING CROWD's Prunella Ransome) sail to an island off the coast of Spain that seems deserted... until its children emerge from the shadows with the blood of their parents on their hands... and hatred in their hearts for every adult. This film comes across as a sort of "Village of the Damned in the Med" when reading the synopsis, but it is so much more. This Spanish masterpiece was originally released in the US in 1976 as 'Island of the Damned', the film was heavily cut. This re-issue from Dark Sky re-instates all the previously cut footage and has a pretty decent picture as well as a crisp dual mono soundtrack. I have to say that personally I love this film. Even if it does borrow on well-used themes of kids vs. adults, it comes across as very fresh and inventive and is certainly a stand-out piece of film-making in my opinion. Where it stands out amongst other fare, is that it is pretty brutal and unrelenting. It pulls few punches as the heroes of the movie (Fiander and Ransome) are forced to battle with their consciences in various 'kill or be killed scenarios' - a scene where the couple are being cornered in a cell is pretty brutal. Another stand-out quality is the 'downbeat' attitude in which WCKAC? is filmed and plays out. Most films of this type tend to inspire some sort of hope for the protaganists as they battle through against the odds, WCKAC? seems to turn this device completely on its head with bleakness creeping in more and more as the seconds tick by; any glimmer of hope seems dashed almost immediately. 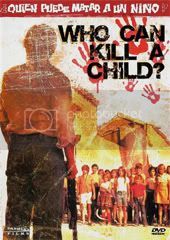 Well shot, acted, and with an initial eerie suspense that builds up to explosions of violence from all parties, leading to a shocking climax, I cannot recommend Who Can Kill a Child? highly enough.